Clauses (2) and (5) are not relevant for our discussion. The provision states in no uncertain terms that the mandatory retirement age of a judge of the Federal Court (the Chief Justice included) is when he or she attains the age of 66 years. However, the Yang di-Pertuan Agong may extend it for another six months and no more. In the case of Tan Sri Md Raus Bin Sharif, since his term of office had been extended for six months, clearly, it cannot be further extended pursuant to this clause. Note that first, this clause provides that the “Yang di-Pertuan Agong….may appoint”. So, it is an appointment, not an extension. In other words, the term of office of a Chief Justice cannot be extended pursuant to this clause. Secondly, that clause talks about “an additional judge of the Federal Court.” The words “an additional judge of the Federal Court” can only mean what they say, i.e. an additional judge of the Federal Court to do the work of a Federal Court judge, not to be the Chief Justice, the head of the Judiciary. So, this clause does not provide for the Yang di-Pertuan Agong to appoint a Chief Justice. Thirdly, the clause provides that the appointment may be made on the advice of the Chief Justice. That clearly supports the appointment of an additional judge of the Federal Court and not of the Chief Justice himself. It is ludicrous for the Yang di-Pertuan Agong to appoint the existing Chief Justice to continue to be Chief Justice on the advice of the Chief Justice himself. 1. There could be a prior understanding (avoiding the use of the word “conspiracy”) between the Prime Minister and the existing Chief Justice that the latter should continue to be Chief Justice. So, the existing Chief Justice advises the Yang di-Pertuan Agong to appoint himself as an additional judge of the Federal Court. Subsequently the Prime Minister, falling back on the normal process, advises the Yang di-Pertuan Agong to appoint him as a Chief Justice. 2. A Chief Justice, who, for some reasons, is very close to the Yang di-Pertuan Agong may be able to win the favour of a Yang di-Pertuan Agong to get himself appointed and reappointed. 3. Suppose the Chief Justice, on his own, advises the Yang di-Pertuan Agong to appoint himself as Chief Justice and the Yang di-Pertuan Agong agrees. On the other hand, the Prime Minister, meaning to appoint a new Chief Justice, goes through the normal process as required by the Constitution and then advises the Yang di-Pertuan Agong to appoint his candidate as Chief Justice. The Yang di-Pertuan Agong will then be in a dilemma. 4. If the backdoor appointment is allowed, what would be the function of the Judicial Appointments Commission and the Rulers’ Conference? 5. It may compromise the independence of the judiciary. 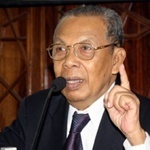 A Chief Justice who wants to be reappointed after reaching the age of 66 years and six months or who has (wrongly) been reappointed may go out of the way to please the Yang di-Pertuan Agong and the Prime Minister, hoping to be reappointed after his term of office expires or after his reappointment expires. This trend may go down the line and the independence of the Judiciary is compromised. 6. It would lead to uncertainty among the judges regarding their career. They would not know who would be the Chief Justice and for how long and what are the chances of their own promotions. Ever since the Clause was inserted in 1965, I do not think that anyone had ever thought that the words “additional judge of the Federal Court” in Article 122(1A) includes the Chief Justice. It is beyond imagination. Therefore, I am of the view that the appointment of Tan Sri Md Raus, will greatest respect to him, for a further period of three years after he has attained the age of 66 years and six months, is unconstitutional. If the appointment were challenged in Court, it would be embarrassing for the next senior Judge, the President of the Court of Appeal, to preside the court to hear the case as it could be said that he has a personal interest. Indeed the same argument applies to Chief Judge (Malaya), Chief Judge (Sabah and Sarawak) and the Federal Court Judges, at least the more senior ones. Unless it can be shown that Tan Sri Md Raus’ appointment has been validly made pursuant to another provision of the Constitution, the honourable way to solve problem is for Tan Sri Md Raus to put aside his personal interest, rise to the occasion and say “I have reconsidered the constitutionality of the appointment and I am not comfortable to remain as Chief Justice and I am tendering my resignation”. If he does that, I am sure that he will be remembered for a long time for his bravery, unselfishness, dignity and integrity. He will also be at ease with himself as long as he lives. The Government should then appoint a new Chief Justice as provided by the Constitution, saving the integrity of the Judiciary and, hopefully, of the Government as well.